Phew, what a long title to this post...... seemed unavoidable though, mainly because I could not think of any other name for this dish that described it as well. Anyway first about the recall, I heard yesterday that there is a recall of products from Trader Joes that contain cilantro. Luckily for me I haven't purchased anything on the recall list from them, but if any of you have purchased any products from them, do check the link here for details of this recall. Dry roast each of the ingredients mentioned under roast separately until each of them turns reddish and aromatic and keep aside to cool. In case of dry red chilies it changes color and looks a little dark red and brown sesame seeds begin to pop a little, then it is done and can be removed from heat. Keep these roasted ingredients aside separately to cool. In a spice grinder powder the lentils + red chilies first, does not have to be very fine can be a little coarse. Then add sesame seeds and peanuts and powder in short bursts of powder, since over grinding can cause clumping. Finally add the roasted coconut and give it a couple of turns with the rest of the powder. Keep this powdered masala aside. In a small pan heat oil, add mustard seeds. When the seeds begin to splutter add green chili and asafoetida powder and stir it a couple of times. Add bell pepper to it and saute until the bell pepper is cooked yet retains a little crunch. Keep this seasoning and bell pepper aside. If you are using brown rice, then place it along with water in a rice cooker, and set it to cook on the brown rice setting. At around halfway point, add the vegetables and allow it to cook along with the rice as well. When done, add salt, mix well then add powdered masala, and seasoning + bell pepper and mix well. Serve hot with pappad and raita on the side or with any other curry of choice. You can substitute white basmati rice or even short grained white rice instead of brown in this recipe. 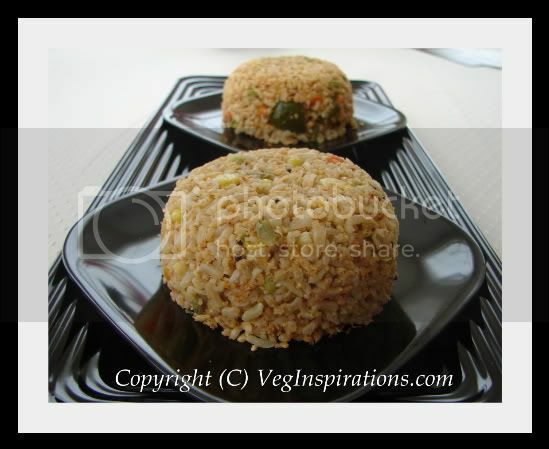 If you plan to make this with white rice, cook the rice in the pressure cooker or rice cooker with water as required so that the grains of the rice do not get mushy but retain their shape, cool this rice a little by spreading on a plate. Steam cook all the vegetables except bell pepper until soft yet firm and keep aside. In a heavy bottomed pan, heat oil and proceed with the seasoning and sauteing the bell pepper as above. Then add the vegetables, stir a couple of times, then the cooked and cooled rice, salt to taste and the masala. Mix well, heat on low to medium low heat without stirring it often, and serve hot with pappad and raita or with any other curry of choice.